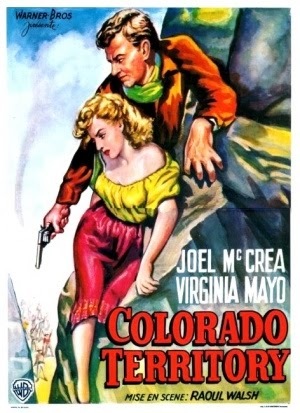 When Raoul Walsh remade his 1940 gangster flick HIGH SIERRA almost twenty years later as the Western COLORADO TERRITORY, he improved on the story. Today, the Western isn't as well known as the gangster story. I suspect this has everything to do with the fact that the original movie starred Humphrey Bogart, while the remake starred Joel McCrea. Today, Bogart is one of only a handful of golden age movie stars still remembered by the public at large. We like to talk about stars as immortal figures, but the truth is that we're only now entering the second century of filmmaking and most of us have already forgotten most of the last century's biggest stars. Don't believe me? Take a poll of the people under thirty and ask them if they know who Bette Davis was. Ask them if they can name a Gary Cooper movie. Go back further. How many can have any clue who Pearl White was? This isn't a lament. Nor is it a "what's wrong with these kids these days." Movie stardom is, relatively speaking, still a new phenomenon. Maybe this is just what happens to movie stars. Nobody really gets to live forever.